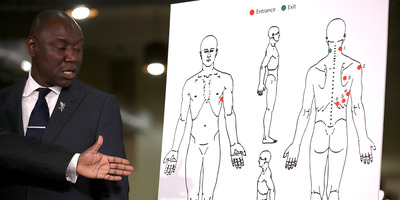 Getty Images/Justin SullivanAttorney Ben Crump looks at a diagram showing gunshot wounds to Stephon Clark during a news conference at the Southside Christian Center on March 30, 2018 in Sacramento, California. An independent autopsy revealed Friday that Sacramento police shot 22-year-old Stephon Clark multiple times in the back and side. The results contradict police’s assertion that Clark was facing the officers when they opened fire. The autopsy revealed that Clark died three to 10 minutes after being struck by the bullets. A striking autopsy diagram revealed to reporters on Friday showed eight bullet entry wounds in a Sacramento man’s back and side – from where local police gunned him down in his grandmother’s backyard on March 18. Stephon Clark, 22, took six bullets in his upper back and neck, one under his armpit, and another in his thigh, according to an independent autopsy conducted by Dr. Bennet Omalu. The findings contradict the Sacramento Police Department’s assertion that Clark had been facing the officers and advancing on them when they opened fire. “The proposition is he was facing officers is inconsistent with prevailing forensic evidence,” Omalu said at a news conference on Friday. Omalu was commissioned by Clark’s family, and is a renowned expert in chronic traumatic encephalopathy (CTE) whose work has been used to craft new NFL safety regulations. He added that Clark likely died between three and 10 minutes after he was shot, and any one of the six bullets that struck his back and neck could have been fatal. Video footage and audio recordings from officers’ body-worn cameras and a nearby helicopter revealed that police began pursuing Clark after they were alerted to a man breaking car windows in the neighbourhood. They saw Clark jumping over his neighbour’s fence and followed him into his grandmother’s backyard, where they yelled at him to show his hands, shouted that he had a gun, then fired 20 bullets at him. Clark was, in fact, unarmed and was holding a mobile phone that the officers appear to have mistaken for a weapon. Clark’s death reignited a roiling nationwide debate over police violence and use of excessive force, and prompted large protests in Sacramento.